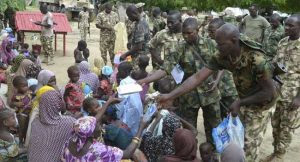 Troops on fighting and clearance patrol Codenamed “Operation TIGER CLAW” on, Tuesday, July 19 2016 swooped on terrorists at Gangere village in Kukawa Local Government Area of Borno State. 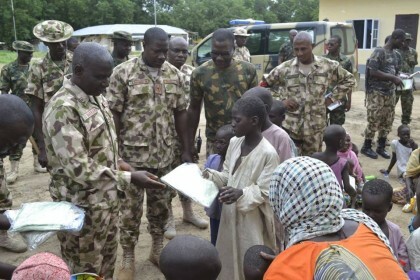 According to the Acting Director Army Public Relations, Colonel Sani Usman, during the ensuing operation, 42 Boko Haram terrorists were killed, while unconfirmed number of the insurgents escaped with gunshot wounds. 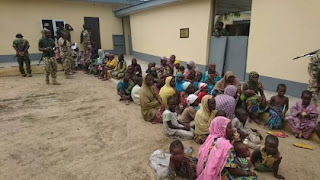 “Similarly, 38 women and 42 children held captives were rescued from the insurgents. The women and children were taken to the military medical facility in Baga for checks. They were further assisted with food and clothing. “The patrol team also recovered 504 rounds of 7.62mm (NATO) ammunition, 162 rounds of 7.62mm (Special) ammunition, 1 Land Cruiser Jeep, 34 Jerry cans of Premium Motor Spirit (PMS) and Automated Gas Oil (AGO), while 55 Motorcycles were demobilized during the operation. “The troops have continued to intensify vigilance and maintained high level of alertness. They are making concerted efforts to clear the remnants of the terrorists in their area of responsibilities,” he said.